We’ve been having fun trying out some new flavor offerings. What is your favorite chocolate candy filling? Do you have a flavor you’d like to see on the menu? Let us know! We love to hear your comments and suggestions! We are pleased to announce the official opening of Kitsch Confections in Alvin, TX! In the mood for a sweet treat? You’ve found it! 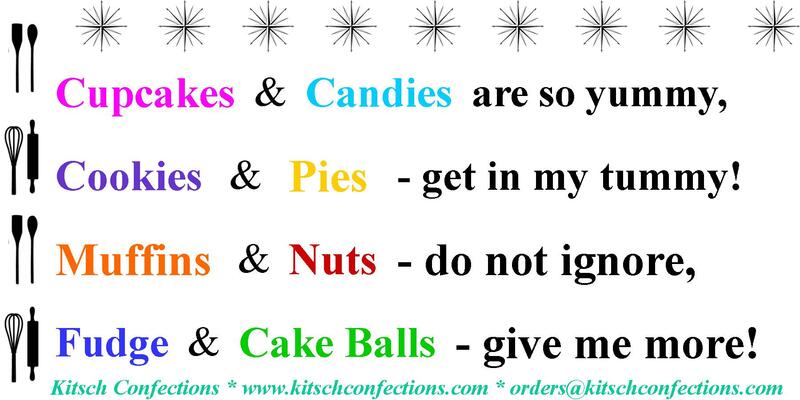 Kitsch Confections offers you the tastiest homemade cakes, candies, cookies, fudge, breads, muffins and other homemade desserts! We will soon be adding a menu and photos as well as information about making orders!